WEIRD AND SPOOKY WEEK IS HERE!!! Blue Planet Aquarium is set to go wickedly weird and scarily spooky to celebrate Halloween (Saturday, October 22nd – Monday, October 31st). And any child that arrives dressed in full fancy dress Halloween costume during the event will be admitted free of charge, when accompanied by a full paying adult. The Cheshire Oaks attraction is showcasing a host of horribly fascinating creatures from toxic toads and slimy eels to stinging scorpions and electric rays as part of its ‘Weird and Spooky’ event. There will be the chance to discover how snakes and spiders shed their skins during special talks and shows which reveal how science fact is even wilder than science fiction. Alongside the chilling cast of creepy critters, visitors will also be able to take part in some weird and wonderful science experiments in the all-new ‘Mad Science Lab’ – open daily from midday-3pm. As well as eccentric experiments, there will be scary science games and the chance to get stuck in to some of the gooiest substances known to man. Plus test your powers of perception with mind-bending optical illusions and crazy brain games. The aquarium will also be covered with cobwebs, packed with pumpkins and also filled with a number of scares and surprises lurking around every corner to help get everyone in the Halloween spirit. Home to more than 100 living displays in six specially-themed areas, Blue Planet Aquarium offers a whole world of underwater discovery. At the aquarium’s heart is the incredible 3.8 million litre Caribbean Reef display, complete with 230ft underwater tunnel, which houses one of Europe’s largest collection of sharks – including three-metre-long sand tiger sharks. Its naturally-themed displays are home to everything from mudskippers and archer fish to lionfish and moray eels. There are daily Aquatheatre shows where you can watch the divers as they feed the fish via a huge underwater viewing window. Other exciting exhibits include seahorses, starfish, piranhas, snakes, freshwater turtles and otters in their spacious outdoor holt. 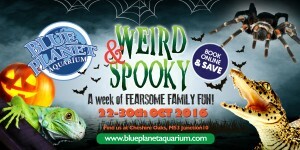 ‘Weird and Spooky’ (October 22nd-31st), Blue Planet Aquarium, Longlooms Road, Cheshire Oaks CH65 9LF. Open daily from 10am. For details call 0151 357 8804, visit www.blueplanetaquarium.com or find us on Facebook.